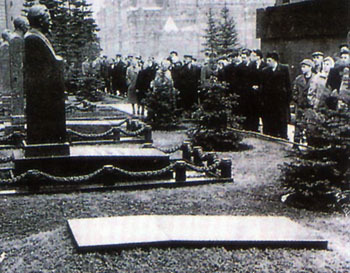 It took about five years, but the culmination of the de-Stalinization campaign begun by Khrushchev in 1956 with his "Secret Speech" finally culminated on 31 October 1961 with the removal of Stalin's corpse from the Lenin Mausoleum and its burial along the Kremlin wall in a simple granite-covered grave. A small marker was added in 1970. Read Khrushchev's Secret Speech (Crimes of the Stalin Era, Special Report to the 20th Congress of the Communist Party of the Soviet Union, Closed session, February 24-25, 1956, By Nikita S. Khrushchev, First Secretary, Communist Party of the Soviet Union), also at www.fordham.edu/halsall/mod/1956khrushchev-secret1.html. These are short versions of the speech. I have available the complete--45 pages or so-- version of the Secret Speech (also available as a *.pdf or *.doc file). Citing specific evidence from the Secret Speech (not from the textbook), what was the purpose of Khrushchev's revelations in the Secret Speech?